Two things I’m going to guess everyone who reads this blog is into: getting fun stuff in the mail, and playing with cool beauty products. Also, I bet a lot of you are into naturals like I am. So, you’ll be as excited as I was about this new, actually cool, fun and useful beauty box kit (also - amazing gift alert). LOLI Beauty lets you create natural skin care products that are specifically tailored to your skin type. It’s organic, food grade, and a little bit DIY (but not too much). 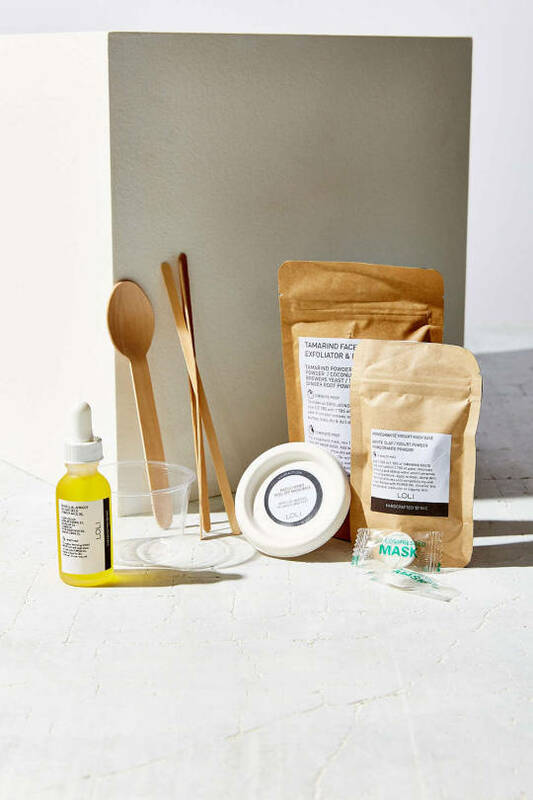 The box is a subscription service, but recently our friends at Urban Outfitters joined up with LOLI to bring you this special edition mask, oil and scrub kit. You have the option to mix and match among the set of mask bases and oils, to personalize your experience (and play). Pomegranate yogurt mask base, maple honey sheet mask peel off base, tamarind face paste exfoliator + mask base, camellia apricot + flax seed power face oil. If you fall in love, you can subscribe to the LOLI beauty site to get a new LOLI beauty box every month. Each will bring you awesome ingredients for DIY beauty recipes for skin, hair and bath & body. Again, I mean, how cute is this as a gift too? The UO kit is only $38 - for all that stuff - which is a crazy deal, too.